Doing this event was not only a personal challenge for our employees, but it was an opportunity to raise funds and awareness for the Camaraderie Foundation and the great work they do for our military men and women returning from the battlefield. Last Friday, Riptide Software teamed up with AIT Engineering to do a 1000 push-up challenge benefiting the Camaraderie Foundation following in the spirit of the #22PUSHUPS challenge, to honor those who serve. Teams were comprised of two to three people with a goal of 1000 push-ups total in a four-hour period. For each team that completed 1000 push-ups, $100 would be donated by Riptide to The Camaraderie Foundation. Amazingly, all teams participating met the 1000 push-up challenge, with five teams going well beyond the goals in personal competitions. The top team at Riptide completed 3342 push-ups and the top three individuals achieved an impressive 1905, 1793, and 1516 push-ups, respectively. The group total of all the team’s push-ups combined was 21,916. 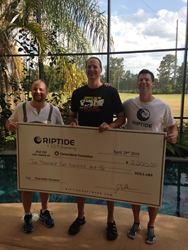 As a result, Riptide Software and AIT Engineering donated $2,200 to the Camaraderie Foundation. The [Camaraderie Foundation is a non-profit organization that provides healing for invisible wounds of war through counseling, emotional and spiritual support for all branches of Military Service Members, Veterans and their families. Assured Information Technology (AIT) Engineering is based in Orlando, FL and is a Veteran-owned Small Business that provides Information Assurance (IA), Information Technology (IT), Networking, Database, and Software Development solutions to the Federal Government, DoD, and Commercial companies. After working with many large DoD contractors and Government organizations, we recognized a tremendous need for IA solutions that focused on implementing policy-compliant that provide the best customer value. We specialize in developing strategies and implementation plans to efficiently achieve maximum IA compliance with minimum resources.